The culinary scene in Edmonton is constantly evolving, and while we feature many amazing restaurants in the pages of our Best Restaurants issue, our 25 Fav Eats issue is a little different. In it, we ask prominent Edmontonians to share their favourite local restaurant dishes – the ones that trigger memories, the ones they turn to when they need a little comfort. Food is about more than simply flavour. It’s about making a connection – to our city, to ourselves and to the individuals with whom we’re sharing a table. Sometimes, a great dish can take you to a different place; it can rekindle a memory or make you think of comfort foods of days gone by. 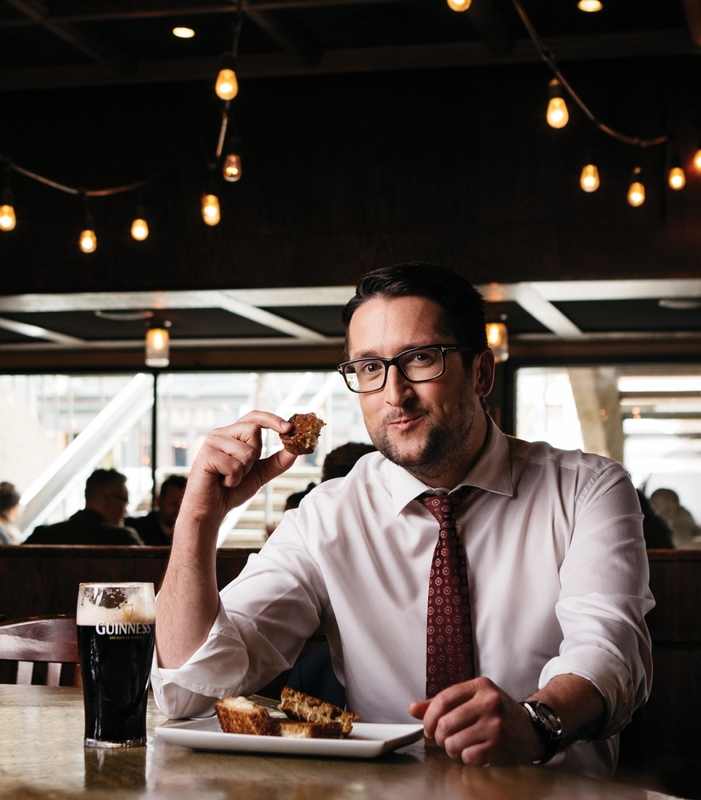 For Top 40 Under 40 alumnus Ian O’Donnell, the grilled cheese at Red Star takes him way, way, way back. You remember how, when you were a kid, you’d get a sandwich chopped up into little “soldiers” to make it more fun to eat? Well, over at Red Star, the kitchen does that for O’Donnell. He says it’s so he can share the sandwich with his fellow pub-goers. But, there’s definitely a fun factor to the food. O’Donnell says the sandwich has a healthy “butter to bread ratio,” and that the gruyre cheese filling has a bit of gentle crust; the sandwich is first put on the pan, then finished in the oven. “It’s got that little bit of crispiness,” he says. 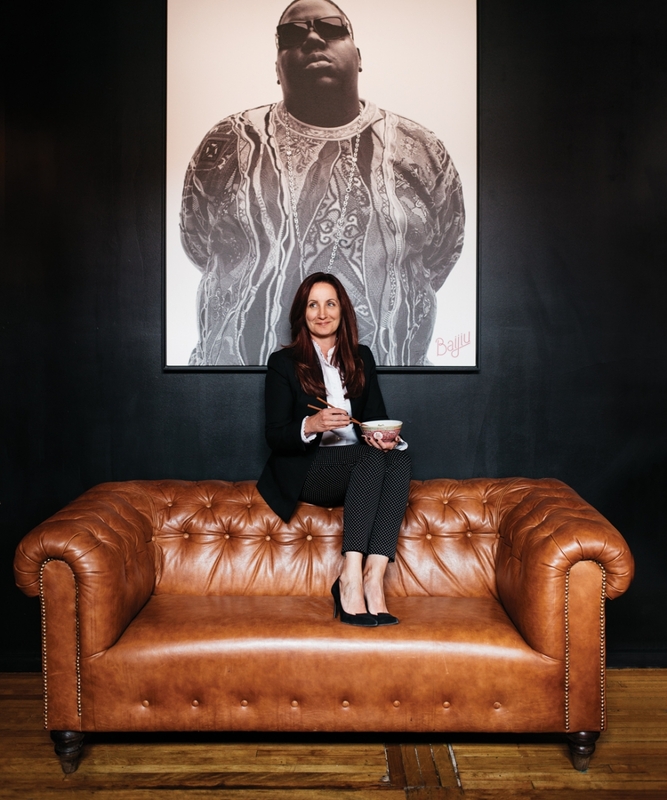 As owner of her own design firm, Sarah Jackson has a busy schedule – so she’s carved out a relaxing weekend ritual that involves a breakfast sandwich. “Every Saturday morning, my boyfriend and I, whenever possible, like to do as little as possible,” says Jackson. “We laze around, get up as late as we can, and go downstairs and get the breakfast sandwich.” Jackson’s partner lives right next door to the Wired Cup, making it almost an extension of his own kitchen. The cafe is cozy and welcoming, the owners are friendly and the food is always delicious. Stephanie Wolfe has enjoyed a decorated acting career; she’s won Sterling Awards for her work on the Edmonton stage, and a “Rosie” – an award for work in Alberta film and television. She’s also a cast member in this year’s Freewill Shakespeare Festival, which is mounting The Merry Wives of Windsor and The Merchant of Venice until July 16 at Hawrelak Park. For a family night out, Wolfe says that Nomiya’s Noodle Bar can’t be beat. Adem first came to Aroma Cup Caf for an event – an evening of storytelling called From Amiskwaciy to Somalia. “The owner, after that event, sat down and introduced herself to me and she offered up her space,” says Adem. The cafe has a small classroom attached, which Adem uses to host initiatives she’s working on, such as her group, Sister 2 Sister. “It’s kind of become this little home and safe place for myself and some of the women of colour that I work with,” says Adem. And, according to Adem, every item on the menu is fantastic. 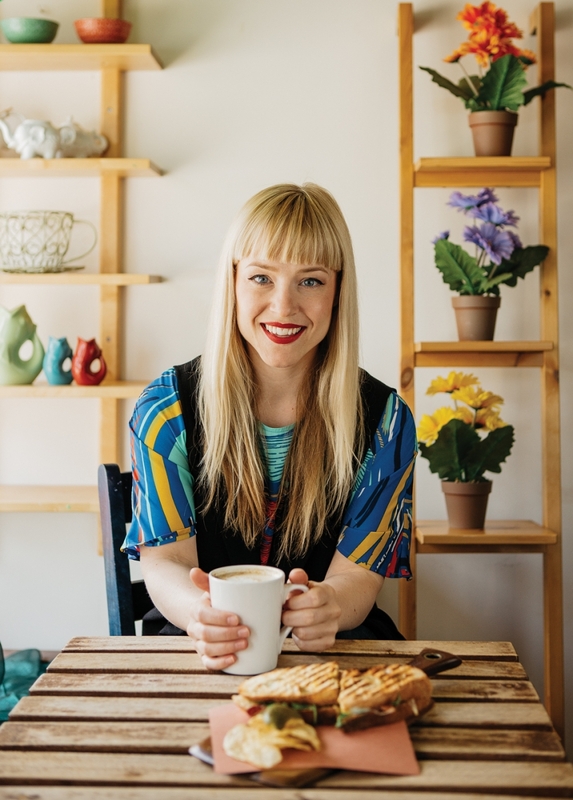 She sings the praises of the savoury items, including a chicken wrap that is “life-changing,” but her favourite dish is something that satisfies her sweet tooth. The mango parfait, which includes fragrant mango ice cream topped with a vanilla wafer cookie, is something she indulges in time and time again. – A.S.
As a young girl, Cheryll Watson went to Chinese restaurants with her family and her father would always want a tour of the kitchen. One time, she was amazed as she watched an older woman fill and seal dumplings at breakneck speed. “Watching her at the speed at which she worked, it mesmerized me as a child,” she recalls. Now, Watson and her husband love to dine out. They go out as much as five times a week, and take a day each month to do an Edmonton food tour, where they hit a series of restaurants and sample dishes. It was on one of these tours that they stopped into Baijiu, and Watson fell in love with the pork and shrimp dumplings paired with a Sakura Spritz, a cocktail which combines Champagne with Cointreau, rose, hibiscus and lemon. “They are so perfectly, proportionally packaged,” she says. – S.S.
Well, if that campaign was to be revived, Julian Faid could star in them. “I will take any opportunity to eat breakfast for dinner,” he says. 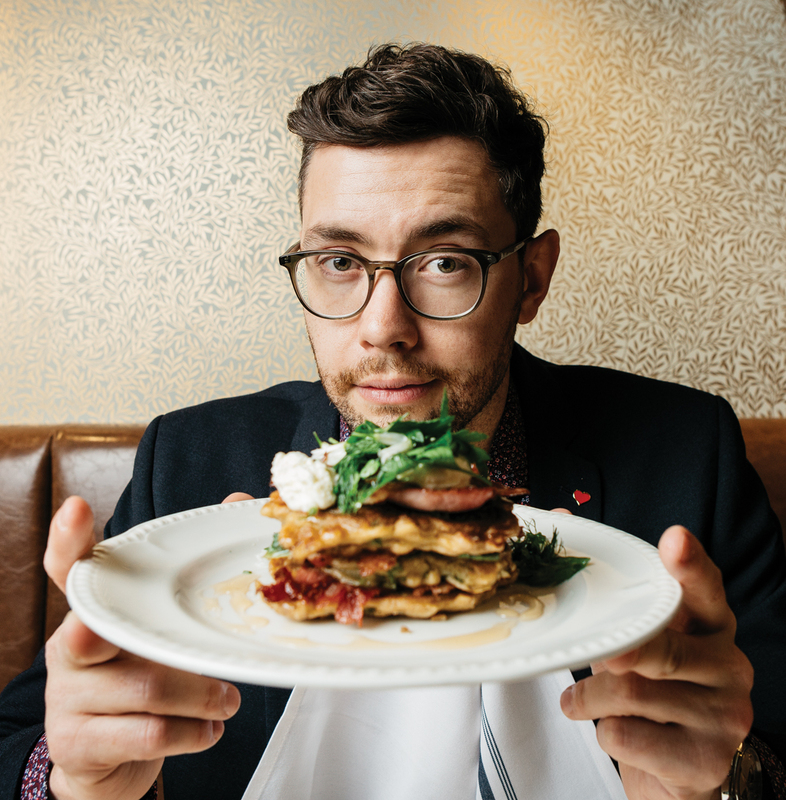 And, currently his favourite is the sourdough rye pancake at Clementine; it’s served with Jambon de Paris – it’s a luxurious take on the tried-and-true combination of pork and pancakes. “There’s a sweetness and a spiciness to it,” Faid says – and adds that it’s good as a bar snack or as a meal. Of course, it should be paired with a good cocktail, and Faid says the staff at Clementine are knowledgeable enough to recommend a great pairing. And he emphasizes that cocktails at Clementine are worth the splurge. “The thing is that we’ve seen a proliferation of $12 to $15 cocktails in the city, but the amount of cocktails that are actually worth $12 to $15 has remained constant.” – S.S.
Chinese cuisine is very regionally based, but, to many of us, dishes from outside of the Cantonese, Szechuan and Hunan region are unfamiliar, unless we count the Chinese-North American hybrid (ginger beef, anyone?) that has evolved on this continent for more than a century. But how familiar are you with cuisine from the Uyghur region, the northwest of China that borders Mongolia, Russia and Kazakhstan? 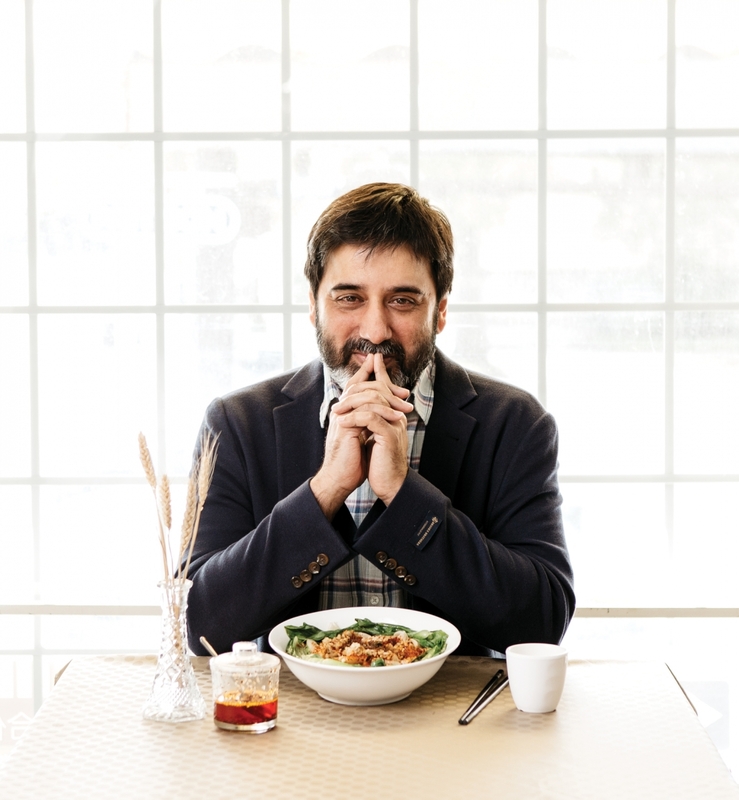 Wheat Garden offers dishes from that region, and Sanjay Shahani really enjoys the Yo Po Mian, a flat-noodle dish served with bok choi, garlic and chili oils, and peanuts. “It’s unique, but it’s simple,” he says. The Mumbai-born and internationally well-travelled filmmaker marvels at how much Edmonton’s food scene has changed since he first visited Edmonton in the mid 2000s. “The city has seen an explosion in restaurants. It has been quite an experience and quite surprising. 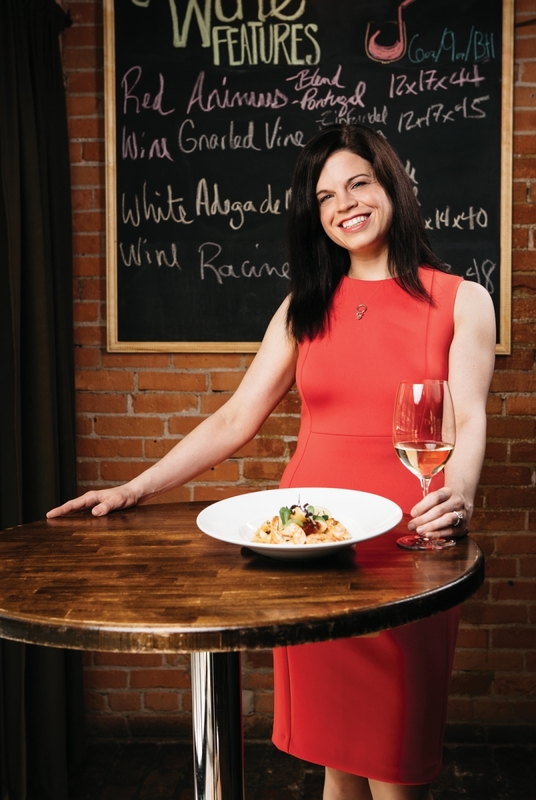 The food scene has certainly grown since I first came to Edmonton.”– S.S.
Top 40 Under 40 alumna Rowena Cui and her husband, R.J. (also a Top 40 Under 40 class member) live in St. Albert and, when she craved a good Alberta steak, she searched for a nearby spot that had it on the menu – and ended up at San Remo. 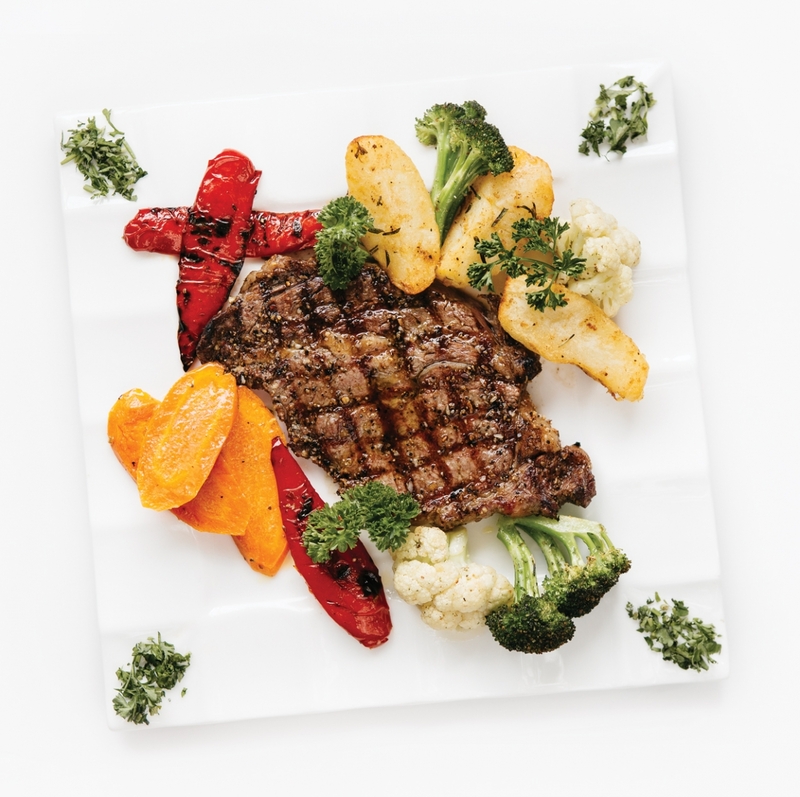 Now, while she mixes up her order by getting different dishes on the side, the Bistecca alla Fiorentina is a must-have, every time. “It is exquisite. It’s the perfect blend of seasoning and grilling, cooked over charcoal to really sear in the juices of the meat,” says Cui. “A little dollop of butter right as it comes out of the kitchen -just perfection.” – A.S. When Dawn Marie Marchand wants to treat herself, she does so with a meal at Sage restaurant in the River Cree Resort and Casino. Such occasions include celebrating a new job, the night she hosted Walrus Talks: Aboriginal City in 2015, and to impress out-of-town guests. 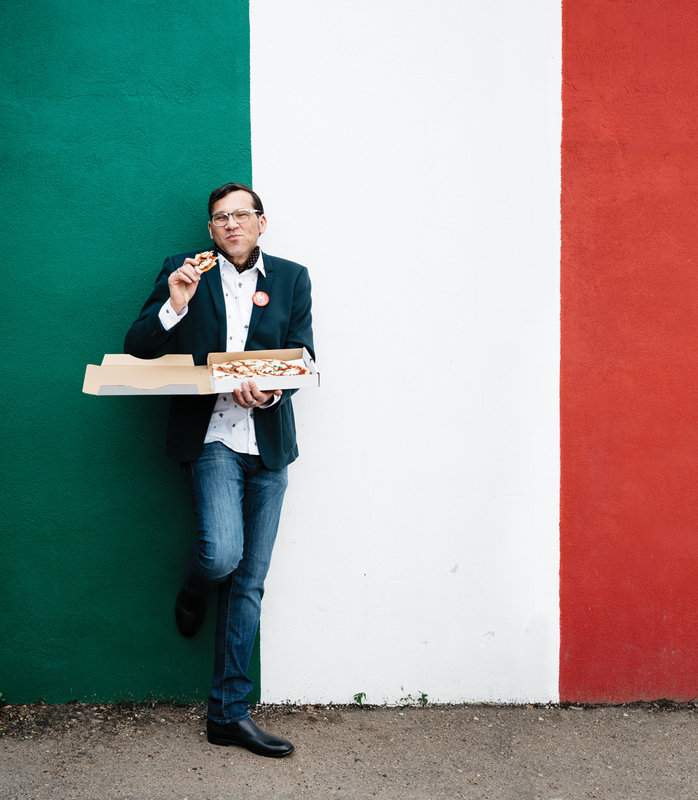 For Todd Janes, a Top 40 Under 40 alumnus and executive director of the Latitude 53 gallery, there’s something uniquely Edmonton about Tony’s Pizza Palace. It was the original Edmonton pizza joint, a place that many of us still see as the archetype for every other pizza parlour in the city. Janes loves the Sal’s Deluxe, which Tony’s advertises as its “most famous pizza.” It has capicollo, prosciutto and bocconcini cheese – a simple but classic combo. 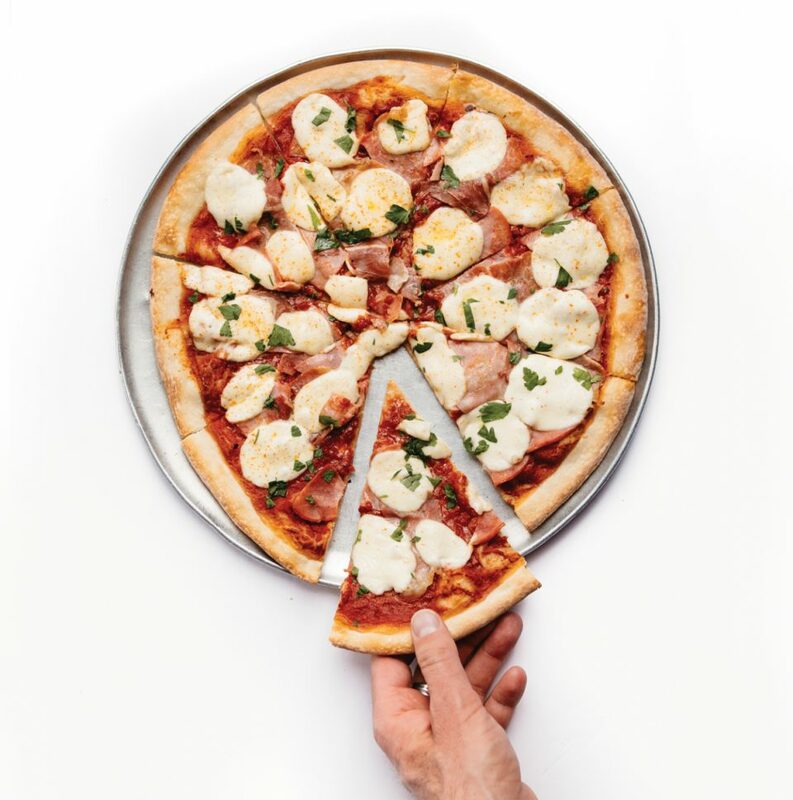 “For anyone who has lived in Edmonton for a long time, we all knew that all we had to do was go to Tony’s for the New York pizza experience,” says Janes. “They still have the people tossing the pizza dough, and you still see kids trying to see over the counter to watch people working in the kitchen. Does anyone else do that anymore?” – S.S.
At Tiffany & Co., Laura Smythe is surrounded by case after case of beautifully displayed jewellery – and she wants that same level of showmanship when it comes to her dining experience. 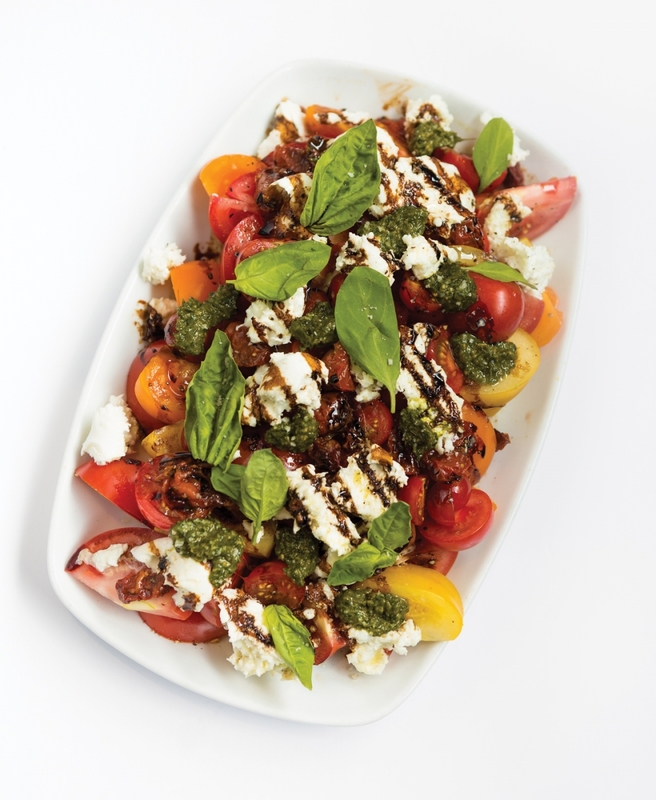 According to Smythe, the mixture of tomatoes, mozzarella di bufala, basil, balsamic reduction and pesto is an unbeatable combo. 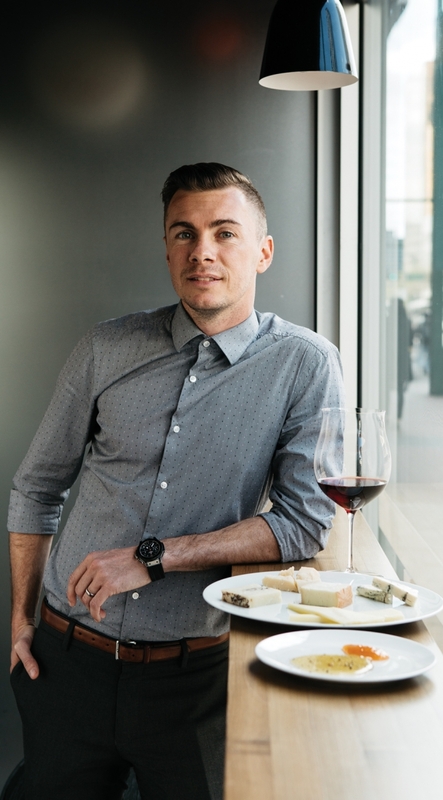 She just has one suggestion – “pair this with a glass of Barolo or Amarone and you will be in heaven – trust me!” – A.S.
McGrath’s son worked for Mini Kitchen a few years back, which gave McGrath the opportunity to try many of the products. The ingredients were prairie-sourced and organic, which she liked, but she was particularly impressed by the love put into all the dishes. “You can feel the commitment and the love that goes into the food, which is really important to me, even when I’m making my own food. “The spices, the textures, the colours, always transport me when I need to be transported outside myself, and they comfort me when I just need to be in my little home cocoon,” says McGrath. – A.S.
Top 40 Under 40 alumnus Ben Weinlick thought long and hard about his decision; to name one of the fine-dining establishments, or his favourite lunch-time hangout? 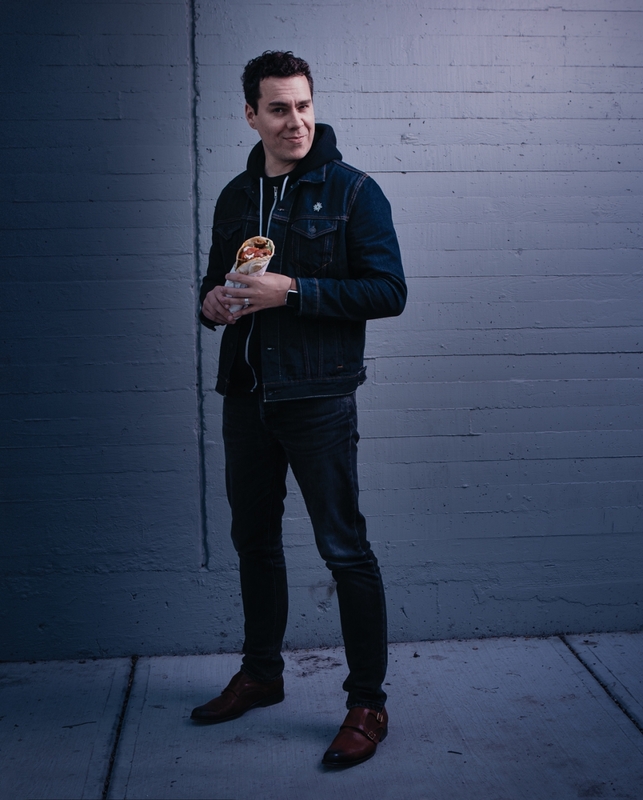 When Weinlick ventures outside of the Action Lab’s 124th Street offices, he heads a few blocks to his favourite donair shop, but not to get a donair. He likes the chicken shwarma, with plenty of the sweet and garlic sauces, but hold the onions. At the Action Lab, agencies gather to find outside-the-box solutions, and Weinlick has been key in getting Edmonton as a leading city when it comes to social innovation. – S.S. If you invite the University of Alberta’s chancellor to a party, chances are that he might just arrive with his favourite Edmonton cake – to share, of course. Located just a short walk from the chancellor’s office, the Upper Crust Cafe makes a German treat that pairs rich chocolate cake with oh-so-buttery chocolate icing that’s jammed with coconut. 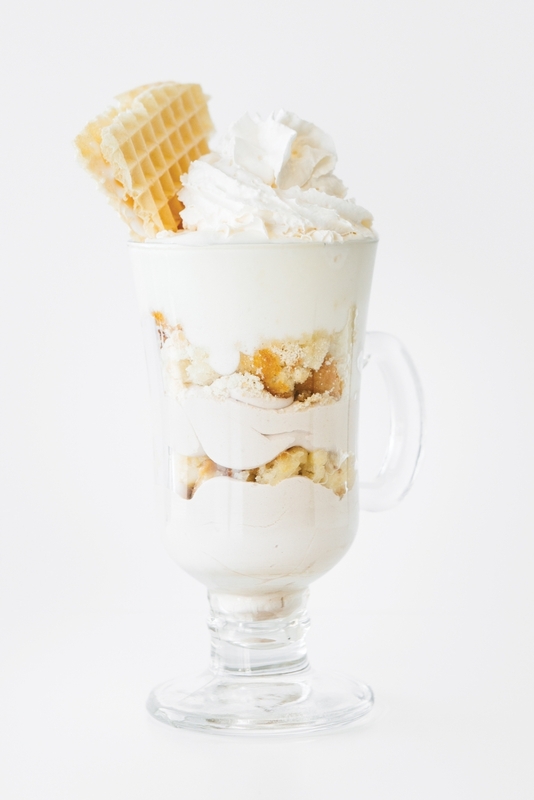 It’s rich, it’s decadent, and it’s Stollery’s favourite dessert in the city. He has been known to order a full-size cake and bring it to parties. He says that absolutely no one complains that he didn’t try to make something himself. “Everybody knows I didn’t make it,” he laughs. “It’s a good thing that I didn’t make it.” – S.S.
Cam Talbot is the busiest man in the goaltending business; this past NHL season, he led the league in games started by a netminder. And, while handling the heavy workload, he and his wife, Kelly, welcomed a twin boy and girl, Landon Thomas and Sloane Colleen, to the world. So, parenting newborns and dealing with the stress of backstopping the Oilers to their first playoff run in a decade, well that can make a guy kinda hungry. He loves going to Vivo, where “I don’t think there’s a bad thing on their menu,” but he also has a go-to on the menu at Violino. 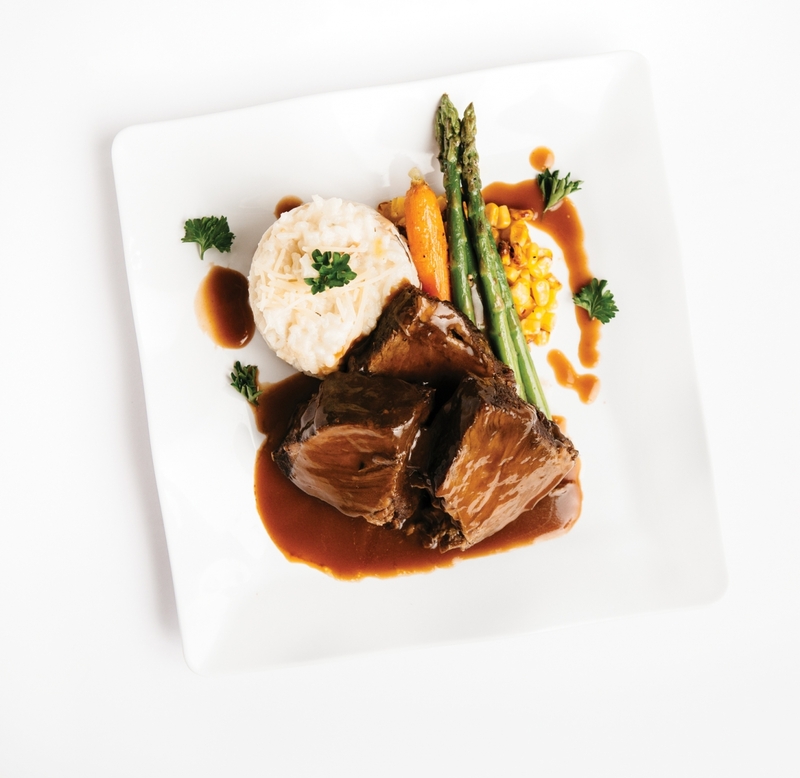 The Violino short-rib (Nervatura) is served with a mushroom risotto and a red wine reduction; Talbot would order it to go so he could make sure to be home to tuck in the kids. – S.S.
Allegro Italian Kitchen on 95 St.
Thiessen is a regular at Allegro Italian Kitchen, a spot in his neighbourhood of McCauley. However, his favourite dish there isn’t even something on the menu – it was a spontaneous creation. You still won’t find the dish on the menu, but, according to Thiessen, the manager is always willing to throw something together for hungry customers. “It’s all super fresh ingredients,” says Thiessen. “A really delicious homemade pizza, made especially for you.” – A.S. Though she’s now a sushi veteran, Dear, a Top 40 Under 40 alumna, continually returns to that particular spicy roll. “The number of people who I have introduced to this dish probably goes into the 20s or 30s,” says Dear. “I had girlfriends and family members who also had become very close to this dish and, anytime that they would go, they would send me pictures of it.” – A.S. The atmosphere and izakaya concept at Dorinku makes it the perfect place for shared plates, but April Dean has one rule – she’s not sharing the ramen salad with anyone, no matter what. Dean first tried the dish shortly after Dorinku opened, before setting off on a trip to Japan, and immediately fell in love. “We’ve been back a few times at tables of four or six people and we’ll order multiple dishes for sharing, and then I will order a ramen salad and I’ll make it very clear that I am not sharing,” says Dean. “I often tell people, if you want to try it, you should order one for the table.” – A.S. Even though he’s been busy with the move from Los Angeles to Toronto to start his new/old gig with TSN in September, sportscaster Jay Onrait still makes time to visit his hometown and check out what’s new with the dining scene. An unforgettable, perfect version of a tried-and-true dish – sounds like a home run to me. – B.M. Dr. Lynne-Marie Postovit, a Top 40 Under 40 alumna, sings the praises of the grilled calamari and prawns at Sabor. And, when the Gairdner Foundation Symposium was taking place in Edmonton, she decided it was the perfect place to take the visiting researchers to celebrate. “We had almost 20 [researchers] from all around the world come to Edmonton, people who have discovered massive things that have changed how we treat the disease [cancer],” says Postovit. “We took them there [to Sabor] for dinner one of the nights. They were really impressed – they loved it, the food was great, the atmosphere is really nice.” – A.S.
Today, Jobber is a successful company that received $8 million in funding from OMERS Ventures in 2015. However, back when it was a struggling start-up, Pillar and his co-workers often headed to nearby restaurants out of necessity. “Our old offices on Whyte Avenue were quite small and we outgrew them pretty quickly,” says Pillar. So, the team would head to Three Boars for off-site meetings. “Back in the day, when we used to go there all the time, we’d get the panzanella salad because it was huge and cheap and we had no money,” says Pillar. While that dish is no longer on the Three Boars menu, there’s one he remembers that remains one of the restaurant’s staples – the chicken liver bomb. “It’s a small bite, perfect to just kind of grab when you’re having a beer, waiting for your big meal.” – A.S.
Nik Ledgerwood thinks of Bar Bricco, chef Daniel Costa’s buttoned-down Italian wine and spuntini bar, as a great place to wind down after 90 minutes of soccer. He enjoys the cheese plates and charcuterie, and has a soft spot for the Black Truffle Moliterno, a sheep cheese from Sardinia. But, is cheese really the best choice for a professional athlete? “It’s a nice way to start the evening; not so much as a meal. But, is it a good [choice] for an athlete? After a win, it is!” – S.S.
Nigerian-born Sam Oboh is no stranger to jollof rice. “It’s a very common delicacy from West Africa, and usually served with beef or fish, and fried plantain,” says Oboh. Now, Oboh can get his fill of the treat anytime he wants at Koultures – no sneaking out required. – A.S.
Bautista now works out of the Mercer Warehouse building, which is home to Rostizado, Tres Carnales’ sister restaurant – but, despite Bautista’s wishes, it still hasn’t added tacos to its menu. “There are many days I wish Tres was there so I could have [the tacos],” says Bautista. “It’s the first dish I had when they first opened, when I first met the guys, and it’s been the go-to ever since.” – A.S.
Arlo Maverick is a fan of goat, though the Caribbean goat dishes he had previously encountered always served the protein as part of a curry. He first ordered the dish at African Safari because he was interested to see how goat would be seasoned in East Africa. The result didn’t disappoint. “The waiter brought out two platters, one with goat colourfully decorated with green and red peppers and parsley, the other with a yellow-tinged rice with raisins, peas and corn. Bite after bite, my taste buds watered for more as I washed it down with the best mango juice I’ve ever had – outside of Jamaica of course!” – A.S.